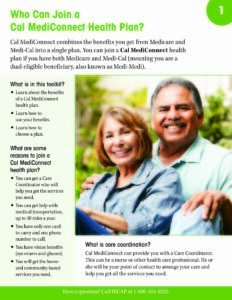 The Department of Health Care Services developed the Cal MediConnect Beneficiary Toolkit to support beneficiaries, their caregivers and key supports, and options counselors in helping choose the best health plan option. Beneficiaries and their caregivers should use this toolkit along with information provided in formal notices and guidebooks. Robust beneficiary outreach and education is a core part of the design and implementation of the Coordinated Care Initiative (CCI) and Cal MediConnect. Beneficiary outreach is focused on two main goals: 1) ensuring eligible beneficiaries understand the Cal MediConnect program and can make an educated choice about whether it is right for them and 2) making the enrollment process simpler and easier for beneficiaries. Early evaluation data on the Cal MediConnect enrollment process indicated that beneficiaries could benefit from specific additional information and materials about the CCI program. Beneficiaries are particularly interested in information about how to retain their current doctors and how to make decisions about their new coverage options. In response, DHCS developed new materials to support beneficiaries and their providers and caregivers in the decision-making process. To ensure optimal usability of the toolkit, a broad range of stakeholders reviewed it and the UC Berkeley School of Public Health’s Health Research for Action center conducted user testing with beneficiaries. This toolkit can be a resource for health plans, advocates, and community organizations, including HICAPs and the Ombudsman, that engage directly with beneficiaries. DHCS continues to update and develop new tools for state outreach coordinators and other community organizations to use in outreach and education activities for beneficiaries. Hoping this includes brief updates as the become available. Is this a download? I don’t see a download button. Do you have the New Cal MediConnect Beneficiary Toolkit in other language ?